A step ahead to compete with the private sector insurers in offering policies with cashless Outpatient Department (OPD) treatment, the public sector general insurance companies are mulling over the possibility to provide cashless outpatient treatment and worldwide covers. In case of overseas cover, there will be no cashless facility; but the medical expenses incurred, will be reimbursed. Most of the health insurance policies in India come without OPD featuring, which require to be hospitalised for a minimum of 24 hours to claim treatment expenses under the policy. OPD coverage includes doctor consultation charges, diagnostic charges and even medicine costs. As of now, public sector insurance companies in India do not cover OPD expenses. However, private sector companies have already offering OPD treatment expenses, and have received tremendous response from the customers. This initiative of public sector general insurers may give a boost to health insurance market. Mr. G Srinivasan, Chairman and Managing Director of New India Assurance said, “OPD consists of almost 60 % of overall medical spends in India, so we need to get into that space and offer reasonably priced products in a few months." 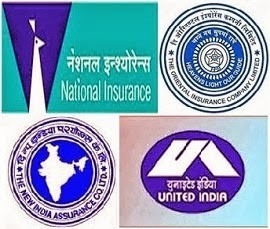 The four public sector general insurance companies are - United India Insurance Company Limited, Oriental Insurance Company Limited, New India Assurance Company Limited and National Insurance Company Limited.